Brahmastra can easily be touted as one of Dharma's most ambitious projects. Scheduled to release in three parts, the superhero fantasy feature stars Ranbir Kapoor, Alia Bhatt, Amitabh Bachchan among others. Director Ayan Mukerji, who recently joined Instagram shared a sweet note to Alia, his lead heroine. Sonam Kapoor and Anand Ahuja were recently touring LA a few months back where the couple would often post fun pictures of their trip. The actress recently shared an exciting montage of their experience at the Warner Bros studio in LA. Film critic Anupama Chopra's round-table interviews always make for informative and fun viewing. She recently invited a panel of digital stalwarts, to have a chat on the new medium that's defining and re-shaping cinematic and television narratives across the world. In attendance were Sumeet Vyas, Mithila Palkar, Veer Rajwant Singh, Sobhita Dhulipala and Rithvik Dhanjani. 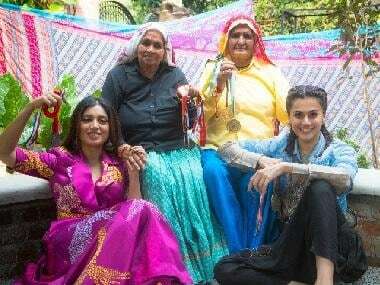 Saand Ki Aankh chronicles the story of world's oldest sharpshooters Chandro and and her sister-in-law Prakashi Tomar. The film features Bhumi Pednekar and Taapsee Pannu in the lead. Bhumi recently shared a picture from the sets of the film. Actor Boman Irani celebrated his grand daughter Sysha's first month by posting heartwarming images on Instagram.